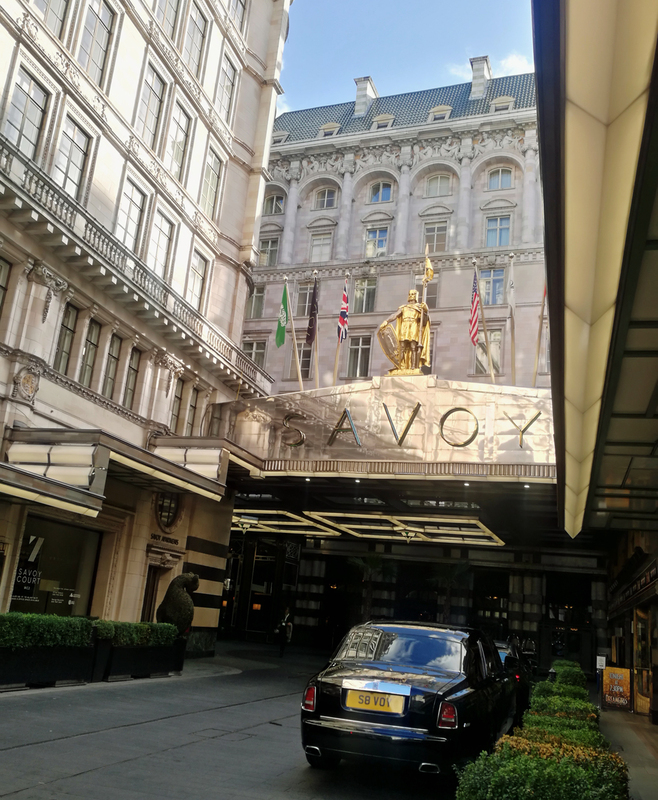 I was something of a regular visitor to the Savoy Hotel before the refurbishment completed in 2010. 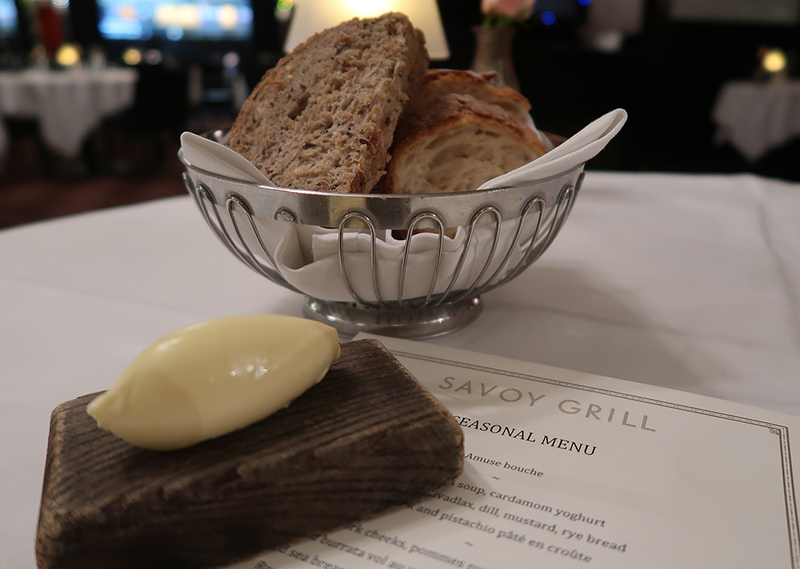 The Savoy Grill was like a comfortable pair of expensive, traditional all leather slippers, worn down at the heel and so easy to wear that you put them on whenever you wanted to relax. We’d go there knowing exactly what to pick from the menu, knowing that the service would be exemplary and knowing that there would be absolutely nothing to fault about the food we were served, though nothing to challenge your sensory perception either. Ruled with a rod of iron by Cesar Ritz the original kitchens were run by Auguste Escoffier, perhaps the world’s first celebrity chef. We didn’t quite make it in those days, but nevertheless I would be handed a menu with no prices and my companion, who used to make a point of turning up without a tie so that he could borrow one from the front desk and ‘conform to the Savoy Grill dress code’, would order for me. 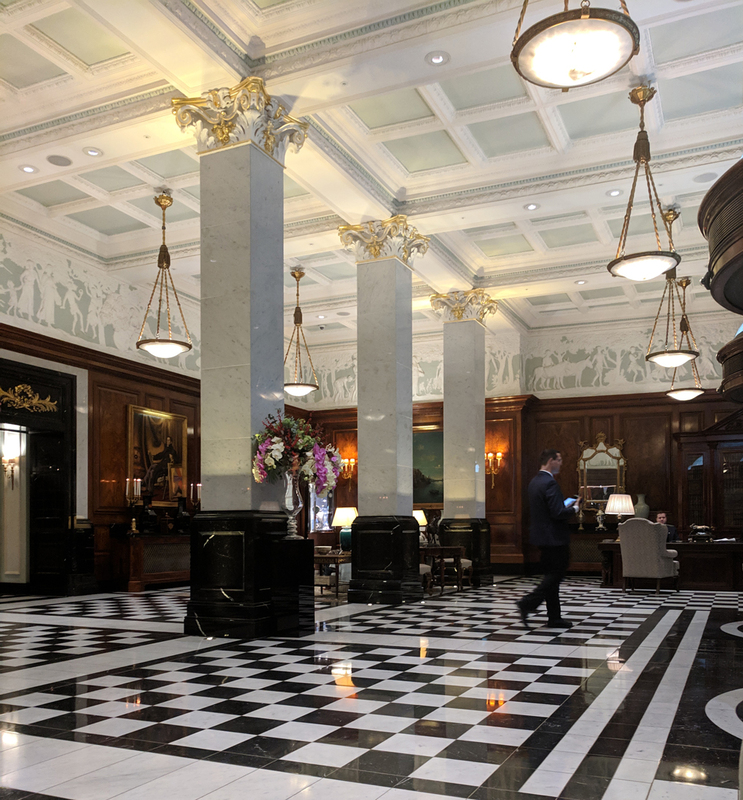 That comfort of familiarity which was our main raison d’etre for visiting the Savoy Grill had probably slipped away some months before the hotel closed for refurbishment, under the reign of Marcus Wareing who had already banished the traditional roast trolley. The last remnants of the old grill vanished in builder’s skip as the Savoy refurbishment took place. When the new grill reopened to a blaze of publicity, headed up by Gordon Ramsey and with the kitchens under the thumb of Andy Cook, I was reluctant to go back. Even an overnight stay at the Savoy didn’t tempt me. 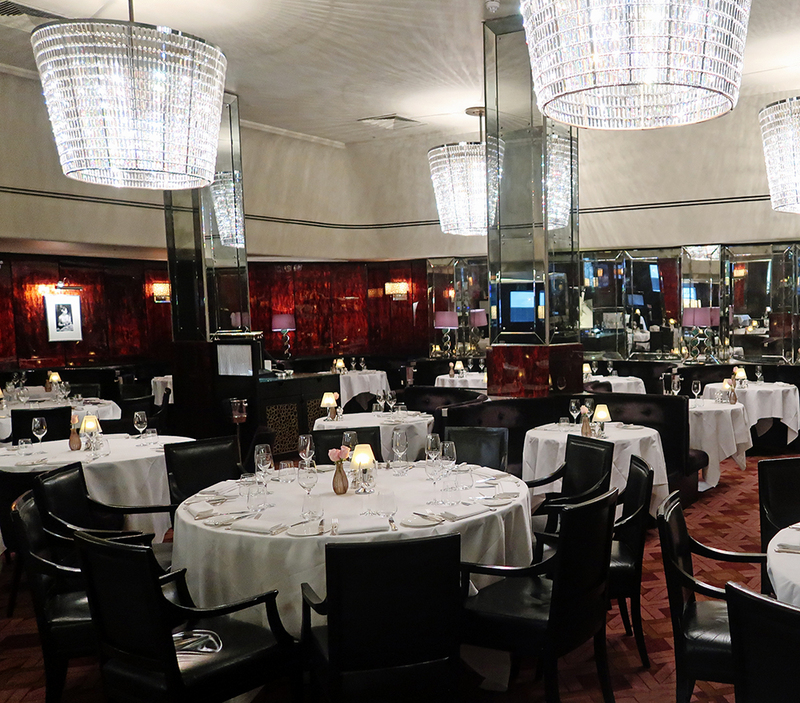 Instead, we ate at Kaspars, the Savoy’s fish restaurant. But, I’ve always had that twinge of curiosity. Lunch this week was perhaps the easiest way to test the water, especially as we’d been asked to review the Red Letter Day offers. 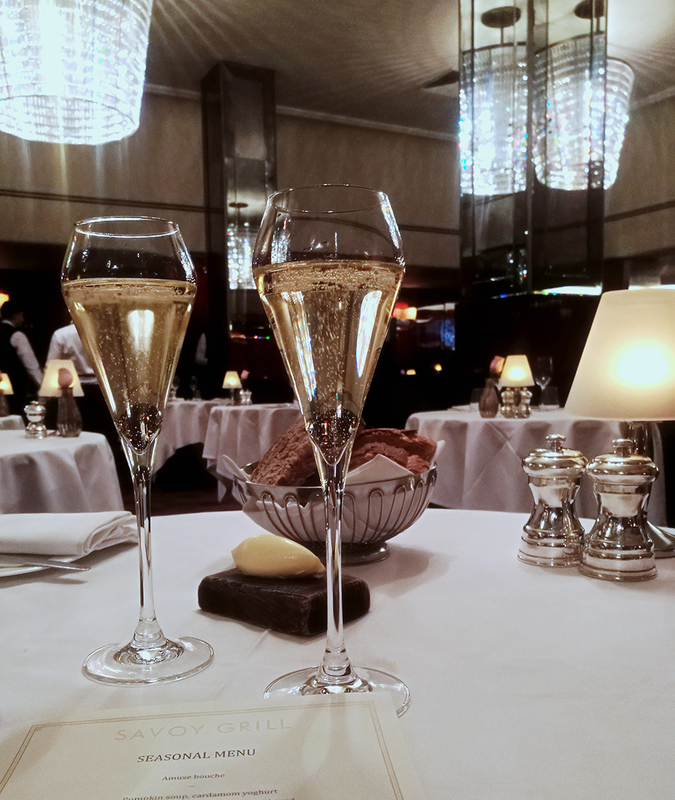 With Red Letter Days, for £99 you can give someone special a real treat in the form of lunch at the Savoy with a glass of champagne to start. I went along with a friend to check that everything was as it should be. Booking was simple. The gift pack included the option of online booking or a reservations line. My friend opted for the former and all we needed to do was to bring the voucher along with us as confirmation. The Grill itself has changed a little, but not to the point of being unrecognisable. The booths, which were famously designed to provide privacy for the famous are a little lower and upholstered in lush blue velvet. There are more mirrors than I remember and photos of some of the famous diners look down on the new clientele. I liked the slightly lighter atmosphere. The seasonal set menu we were offered had plenty of choice including one vegetarian option for each course. And, the roast trolley had returned – on our visit there was a stuffed rolled loin of baby pork, along with ‘catch of the day’ providing an extra seafood option. That meant there were six dishes available for the main course. 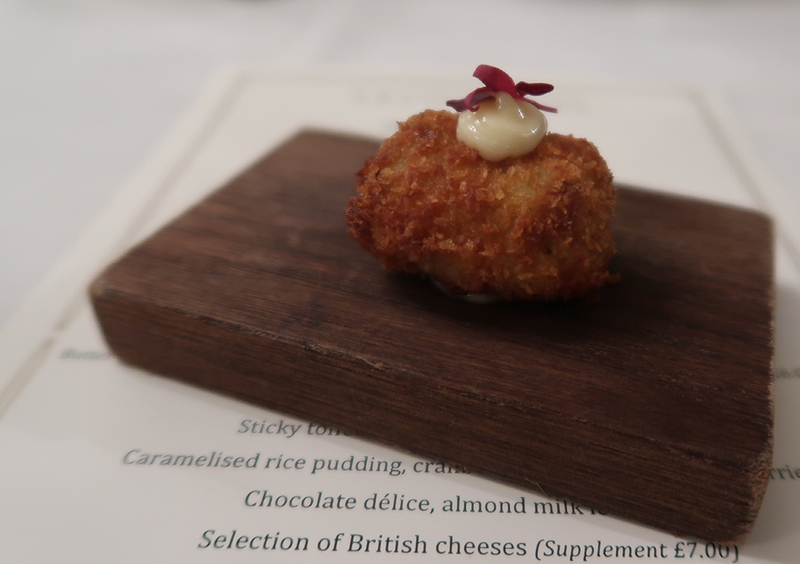 After some delicious homemade bread and butter, we were served a tiny Cod brandade amuse bouche. Enough to make me want to go back and try the a la carte at some point, this was an excellent classic taster with a contemporary presentation. 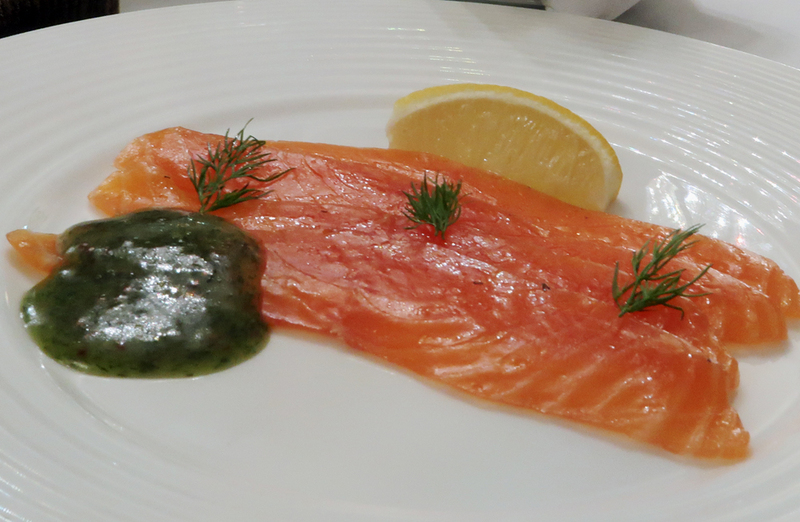 My Salmon gravadlax with dill, mustard and rye bread was delicious. The soft, cake-like consistency of the rye bread surprised me but it worked remarkably well with the firm, beautifully cured gravadlax. 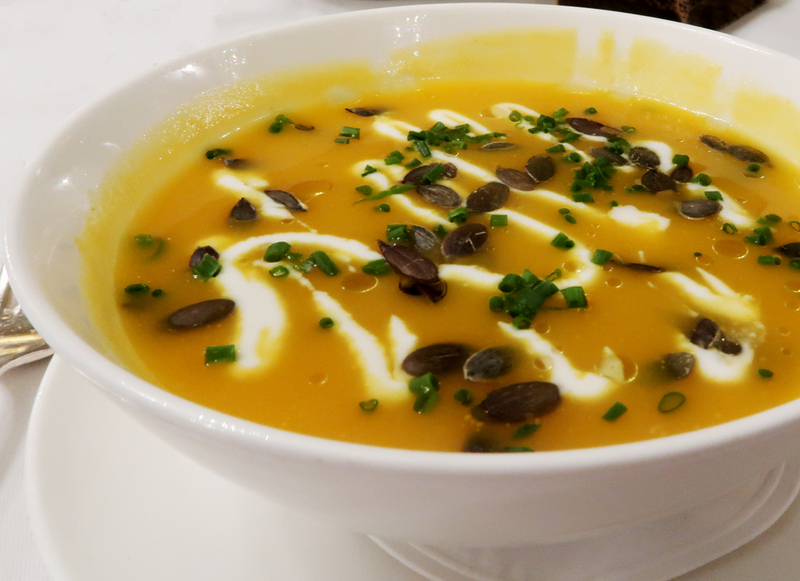 Pumpkin soup with cardamom yoghurt enjoyed by my companion was a fragrant testament to Autumn seasonality and looked like a work of art. True to my own perception of the Grill we opted for a conservative main course – and because we wanted to share a good bottle of wine, agreed that we’d both have the same dish. 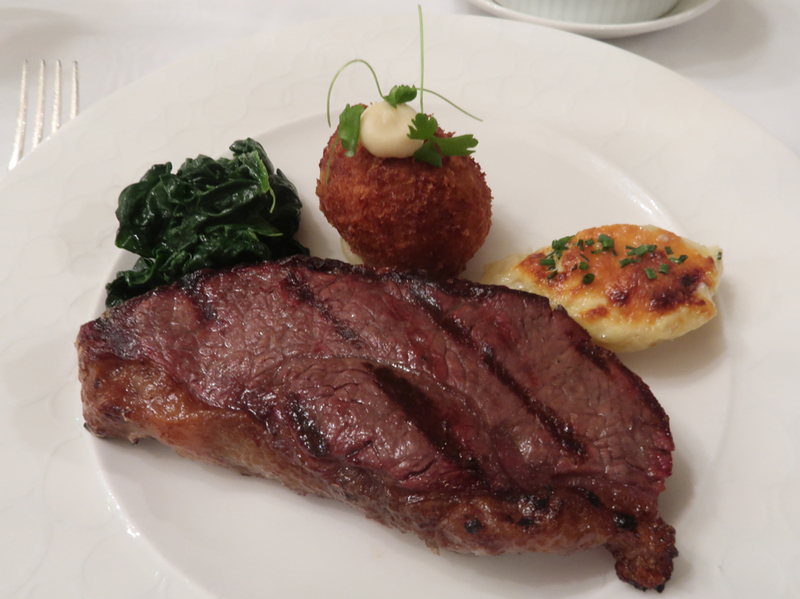 Rare breed sirloin came with a truffle croquette and red wine jus. It carried a £20 supplement (the only listed menu main course item that did) but, neither of us regretted our choice. Dauphinoise potatoes and sauteed spinach side dishes were also extra, though not unreasonable at £6 a dish. 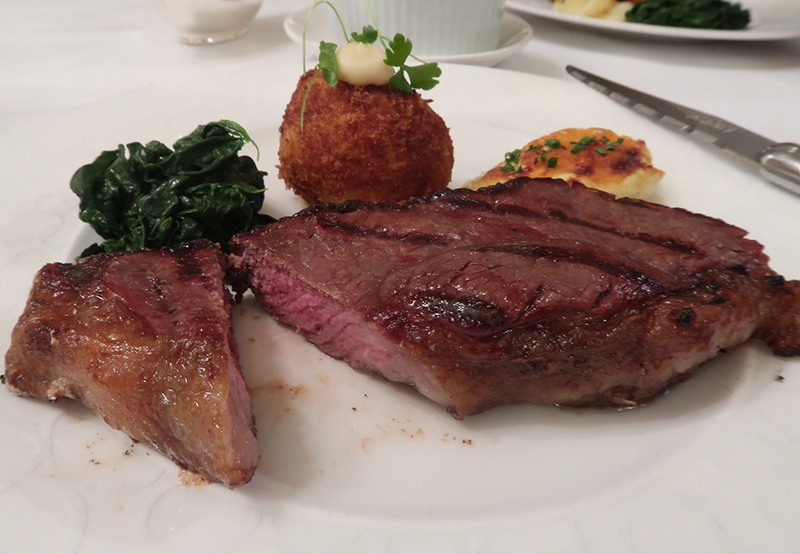 The steak was beautifully cooked with a lovely caramelised char hiding a perfect medium rare centre. Well rested, there was hardly a drop of blood on the plate and that perhaps explained the tender, melting texture. It did pair perfectly with my companion’s choice of wine, a Margaux. He was ‘upsold’ the bottle we enjoyed by the helpful sommelier who recommended that 2012 was livelier and a better lunchtime drink that his initial request for 2002. 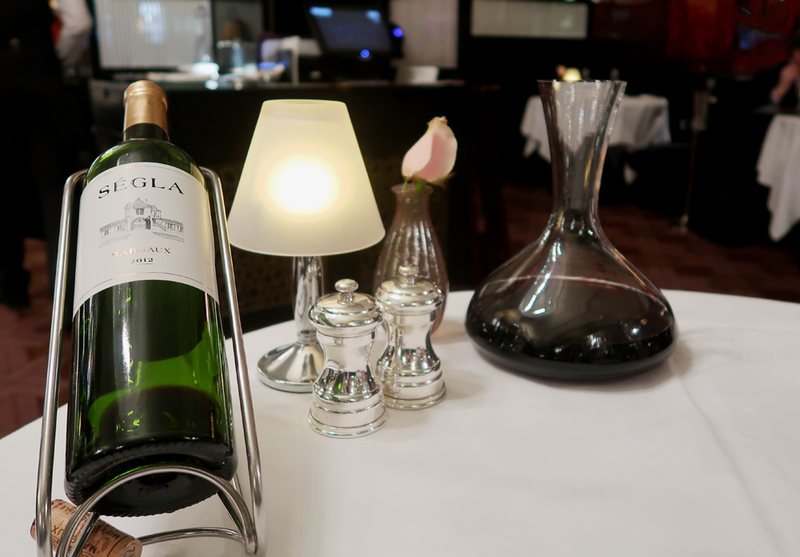 Now at this stage, I must point out that we have always enjoyed a bottle of Margaux when we dined at the Savoy Grill. 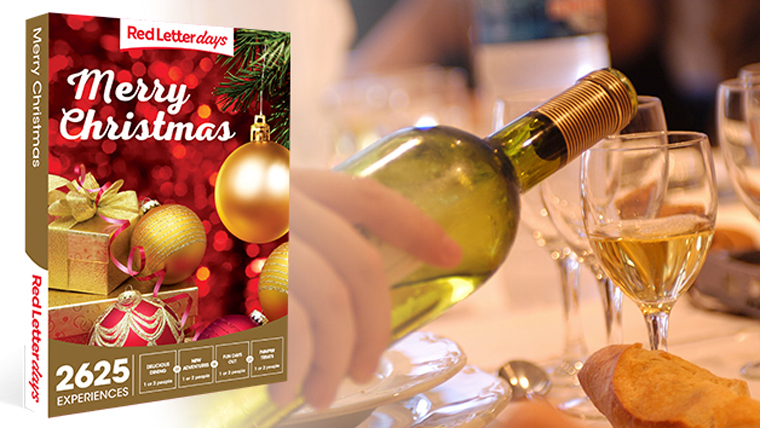 There are more reasonably priced options on the menu including sommelier’s selections at £34 a bottle. For dessert, I picked the sticky toffee pudding with clotted cream ice cream. The pudding itself was light to the point of fluffiness and laced with nuts. 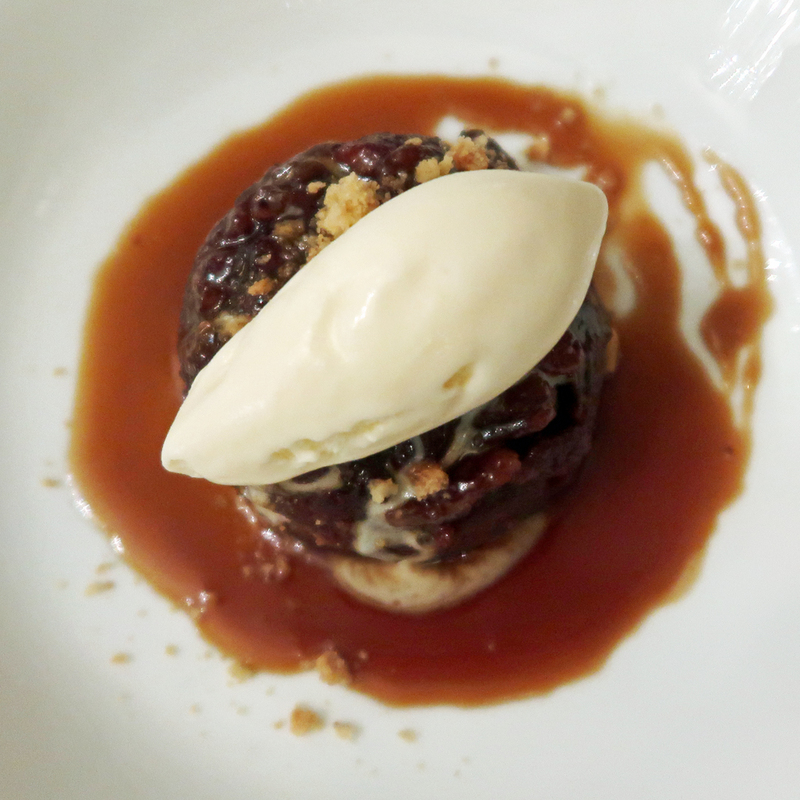 A good dollop of gently caramelised sauce and a portion of ice cream made this a delicious Autumnal treat. 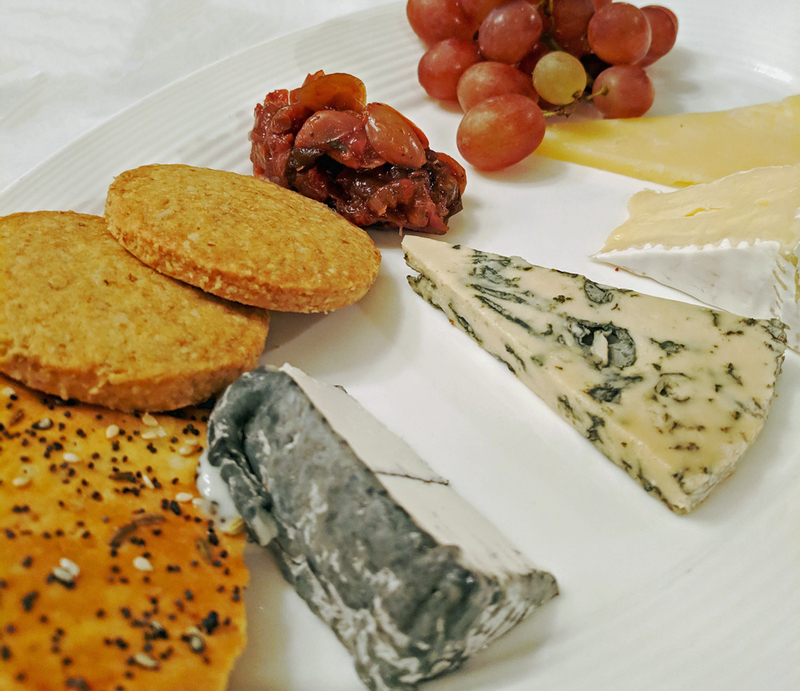 My companion enjoyed the Selection of British cheese (£7 supplement) which I suspect he ordered deliberately so that he could enjoy the last of the wine. After coffee and delicious chocolate truffles, we staggered out to have a look at the private dining room on the first floor which is a truly elegant space. 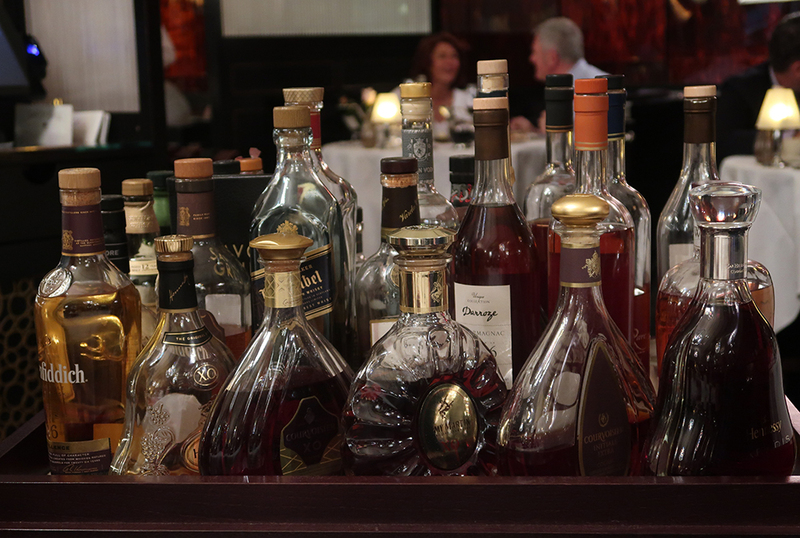 Given it was lunchtime, we were probably wise to skip the Savoy Grill brandy trolley, though it was oh so tempting! An excellent overall experience, I didn’t have a moment of disappointment. I feel as if I’ve found that old pair of slippers again, that someone has polished them, resoled them and somehow freshened them up without losing any of the comforts I used to enjoy. 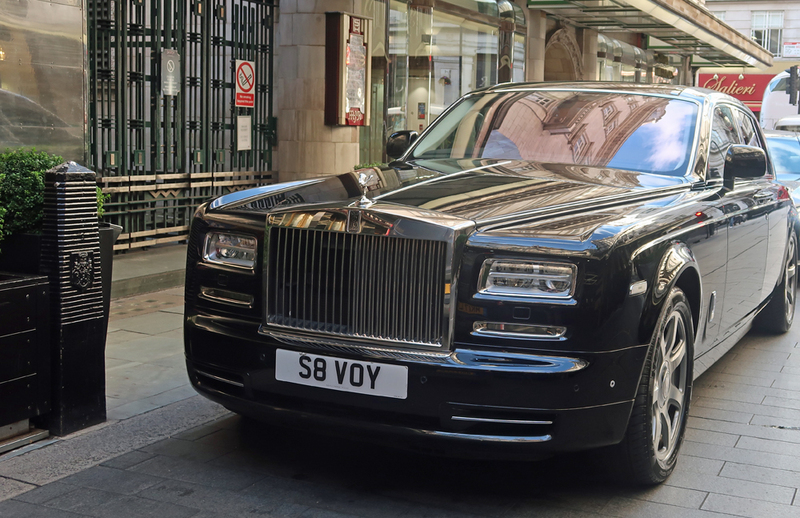 And I’ll be back again because the Savoy Grill manages to be special, whether or not you roll the boat out and enjoy the a la carte menu or stick to what is a thoroughly reasonable set menu. 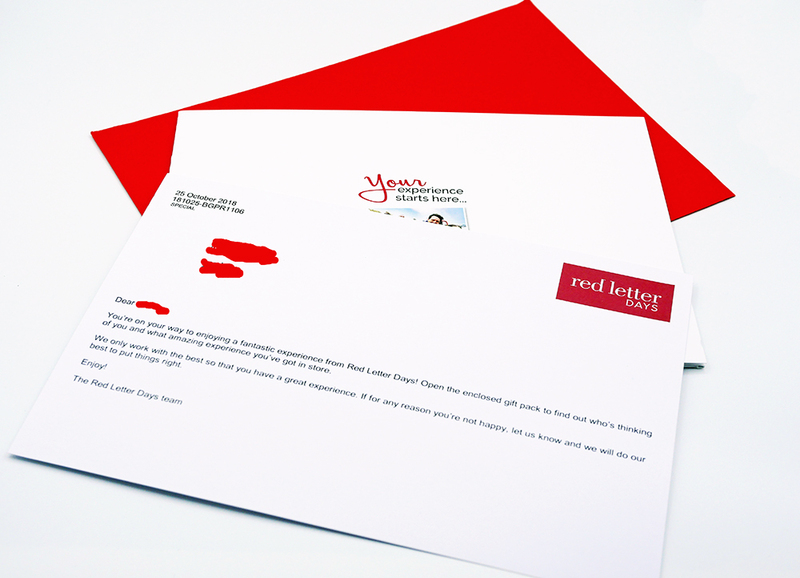 I’m also impressed with the Red Letter Days voucher. I’ve tried using discount vouchers before for dining and been so disappointed in the set menu offered that the ‘treat’ element has been completely lost. That certainly wasn’t the case here. Starting with a glass of Champagne is always good. And, although we did add quite a lot ourselves, it certainly wouldn’t have been necessary to do so and have a wonderful experience. A nice family glamping trip or hotel stay would be lovely.